Offering high performance, enormous space, and a classic all-aluminum design, the Cooler Master ATCS 840 Case is leaps and bounds ahead of the competition. It's unique aluminum construction lends itself to the already-impressive thermal design, allowing the case to be both lightweight and structurally sound. 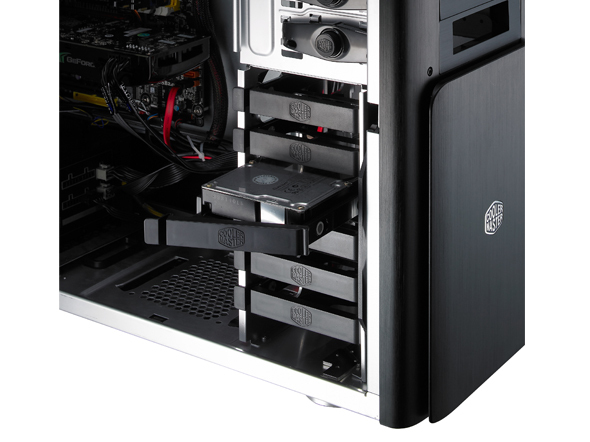 To keep your jaw firmly planted on the floor, the Cooler Master ATCS 840 Case is equipped to deliver an unbelievable amount of cooling, featuring three separate 230mm fans that offer unparalleled exhaust airflow. Further cooling includes a meshed top panel design (for maximum ventilation), extra fan space, and external air ducts for graphics card cooling. The impressive specs don't end there. This sleek black Cooler Master ATCS 840 Case also comes with an elegant design that's both easy to install and easy to maintain. Amongst it's time-saving features are a slide-out motherboard tray, cut out CPU access, tool-free HDD casing, a patented finger pressing 5.25" drive, and a mounting system that will allow you to install two separate power supplies on the top and bottom of the case. Helping you bring your system modications smoothly into the modern age, the Cooler Master ATCS 840 Case is equipped to let you install any components you desire, supporting all the latest standards such as E-ATX and the aforementioned dual PSUs. Material: All-Aluminum Dimensions: 9.57" x 22.83" x 24.80"
Side Panel: Solid Drive Bays: 6 x 5.25" / 1 x 3.5" / 6 x Hidden 3.5"
Dimensions: 9.57" x 22.83" x 24.80"